Village of Monterchi, the hub of our Tuscan adventure. Anghiari: Medieval town with impressive rampart walls. Visit the Palazzo della Battaglia to learn about its importance in the war between Florence and Milan in 1440. Great selection of restaurants, including the Michelin-rated Da Alighiero. Allow a half day. Arezzo: Down-to-Earth, mid-sized city without the crowds of tourists. It is best known for the frescoes by Piero della Francesca in the Basilica de San Francesco. Scenes from the film Life is Beautiful were filmed here. Great shopping along Corso Italia. Catch the train in Arezzo for an hour-long ride to Florence. Caprese Michelangelo: This tiny hilltop village is the birthplace of the artist Michaelangelo. Contains displays of plaster casts of many of his important works along with a collection of 20th century sculpture. Quick stop, allow an hour or two. Cortona: Extremely hilly town overlooking the Val de Chiana and Lago Trasimeno. The main tourist street is relatively flat, but a climb through the residential neighborhoods to Santa Margherita Church reveals amazing views of the valley below with no crowds. Montepulciano: Possibly our favorite of the smaller medieval towns. Moderately steep streets are lined with wine and cheese shops and artist’s galleries and workshops. Less tripperish than average. Keep your energy up with free samples of wine, cheese and sausage at every store as you make your way to the top. Excellent views from the terrace of Palazzo Communale (€3). Allow a half day to a full day. 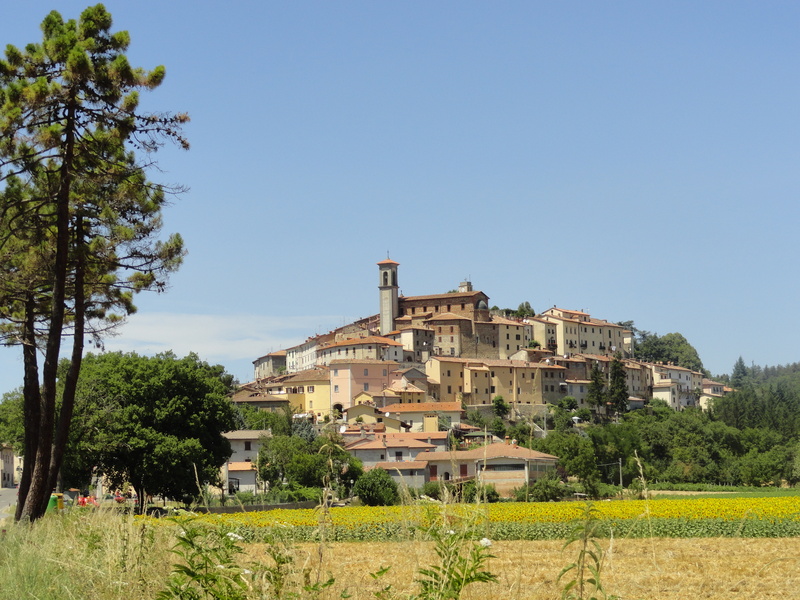 Monterchi: Quaint hilltop village. Home of famous frescoe Madonna del Parto. Stop for coffee in the main piazza at the top. Ask for Marco. Republic of San Marino: It’s like a whole other country … because it is. San Marino is the world’s oldest republic and has the world’s oldest in-use constitution. Surrounded on all sides by Italy, the country is made up of nine villages on 24 square miles of land with a population of around 30,000. The main town features 3 iconic castle towers perched on top of Mt. Titano that provide views to the Adriatic Sea. Fun Fact: Abraham Lincoln is an honorary citizen. Siena: Beautiful city of 60,000 with renowned university. Was once a rival to Florence, now is a more manageably sized, less crowded place to explore. Piazza del Campo is considered one of the greatest public spaces in Italy. Don’t miss the dizzying climb up the 300 foot Torre del Mangia and the panoramic view from the top. This entry was posted in En Route, Travel Resources and tagged Medieval towns, Tuscany. Bookmark the permalink.